It sounds like the punchline to a joke, but it's true - I had an interview with Santa Claus yesterday. 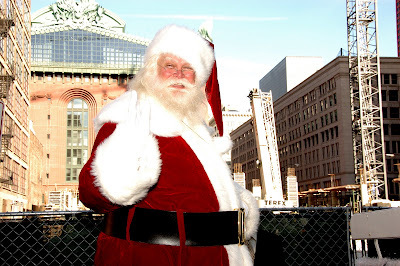 He's making an appearance at the Chicago Thanksgiving Parade and is looking for a capable photographer to document the event. As you can see from browsing my photos, I'm a big fan of unique photo opportunities, so I had to apply for the gig because being Santa's little paparazzi elf for a day definitely qualifies as unique! It was like a scene out of one of my more surreal dreams - here I am sitting across the table from the 6'6" 315lb bearded icon himself, and we're talking about blogs. Santa was curious about why I have a blog instead of a website. I explained to him that I wasn't happy with the traffic from my old website, and after attending an internet marketing seminar earlier this year, I learned that the search engines love sites with fresh content. This was the opposite of what I had been doing - throwing up a bunch of photos with almost no text. Now that I have a blog with lots of articles, I get far more traffic and the quality of that traffic is far better because you and all of the visitors here get to know me personally by reading my blog posts and checking out the flickr page and myspace page . As a result, I don't have to "sell" myself as hard anymore - most of that work is done for me. However, it seems that I have a slight problem in the image department. Before we met yesterday, Santa saw my photos and thought I was some kind of strange artist-type. For the first time, I wondered what impression my photos make on the people who've never met me. Would you post a comment to let me know what YOU think? p.s. I just got a phone call - Santa picked me! Let's hope he doesn't check his list twice this year, because I'm pretty sure I've been naughty! Be sure to check my flickr page to see the photos. I hope you are doing well. Appreciated the opportunity to talk to you before the parade. I did some blogging in the "off-season" as well, so you can read through some of the back issues if you are interested. See you soon! Stay on the "Nice List".